It's easy to can your own Asian pears! Here's how to do it, complete instructions in easy steps and completely illustrated. In the winter when you open a jar, the Asian pears will taste MUCH better than anything you've ever had from a store, and by selecting the right fruit, it will use less sugar than store-bought canned Asian pears. Asian Pears can be packed in very light, light or medium sugar syrup. They can also be packed in water, apple juice or white grape juice. Prepared this way, the jars have a shelf life of about 12 to 18 months, and aside from storing in a cool, dark place, require no special attention. You might also be interested in making pear butter! 1 Water Bath Canner (a huge pot with a lifting rack to sanitize the jars of Asian pears after filling (about $30 to $35 at mall kitchen stores and local "big box" stores, but it's usually cheaper online from our affiliates) You CAN use a large pot instead, but the canners are deeper, and have a rack top make lifting the jars out easier. If you plan on canning every year, they're worth the investment. Store fresh pears in the refrigerator for up to 3 weeks. An average of 17-19 pounds is needed per canner load of 7 quarts; an average of 11-13 pounds is needed per canner load of 9 pints. 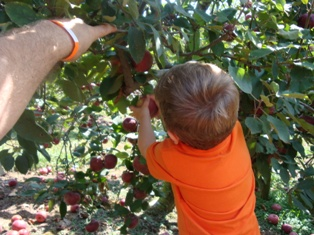 A bushel weighs 50 pounds and yields 16 to 25 quarts - an average of 21/2 pounds per quart. A pound of pears yields 2 cups of sliced pears. You can pick your own, or buy them at the grocery store. But for large quantities, you'll find that real* farmer's markets, like the Farmer's Market in Forest Park, Georgia have them at the best prices. 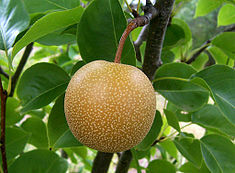 Asian Pears must be packed in a solution of water and sugar or fruit juice. It's up to you which to use. Sugar is added to improve flavor, help stabilize color, and retain the shape of the fruit. It is not added as a preservative. Sugar solution is much less expensive (unless you have a supply of cheap grape juice), so I usually use a light solution to keep sugar (and the added calories) to a minimum. NOTE: you can ALSO use fruit juice (if you want a natural alternative; white grape juice or apple juice are ideal) or water or artificial sweetener (Stevia, Splenda), but NOT Nutrasweet; if you want a low calorie alternative). click here for instruction about how to prepare these sugarless, fruit juice, Stevia, or Splenda) solutions! To prepare syrup, while heating water, add sugar slowly, stirring constantly to dissolve. Bring to a gentle boil. 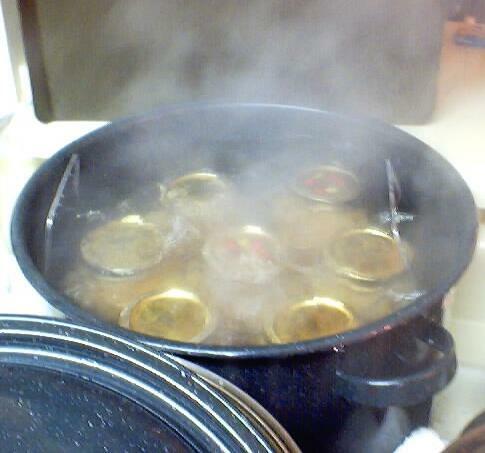 Fill jars while syrup is still boiling hot. 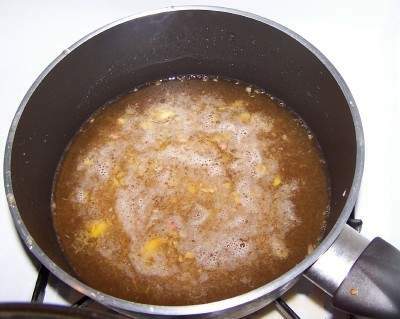 After preparing the liquid syrup, keep it hot (but not boiling). Step 5 -Wash the Asian pears! Peel Asian pears just like you would a potato or an apple. Cut lengthwise in halves and remove the core (it has seeds just like an apple). A melon baller or metal measuring spoon is perfect for coring pears. Cut out any brown spots and mushy areas. Cut the Asian pears in half, or quarters or slices, as you prefer! Remove pits! A visitor writes on September 19, 2013: "I thought I'd pass on a tip I was told from a farmer wife 37 years ago. You can blanch Asian pears. Bring your pot of water to a boil. Put in 2-4 Asian pears at a time and then remove. Don't let them sit in the water more than a few seconds. Place under cold water and the skin comes right off. I then put it in a bowl of cold water with fresh fruit. This has been a life saver for me and thought you'd like to know about it." Now, to keep the fruit from turning brown, when you get a bowlful, sprinkle 1/4 cup lemon juice or Fruit-Fresh (which is just a mix of citric acid and vitamin C, perfectly natural). Then stir the Asian pears to make sure all the surfaces have been coated. "I just canned them last week and the water bath produced nice white Asian pears, but the pressure canner turned them pink. I had never seen that before, glad to see from your instructions that the Asian pears are ok. Suggestion for keeping Asian pears from turning brown from an old Farm Journal Freezing and Canning cookbook: After peeling, coring, etc. the Asian pears, drop them in a solution of 2 tblsp. each of salt and vinegar to 1 gal. water. 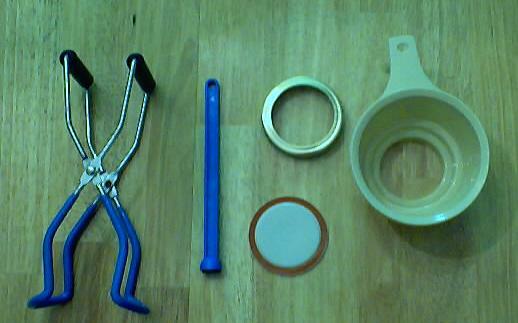 Drain before packing jars or putting into syrup for hot pack. Used this method many times and always produced nice Asian pears. Thanks again for the information. " Hot packing is recommended for all fruits because it is a bit safer and makes fruit easier to pack in jars. Raw packs also make poor quality Asian pears. Hot packed Asian pears are less likely to float than Asian pears canned by the raw-pack method. Just put the cut Asian pears into the boiling syrup solution for 5 minutes. Neither the USDA nor the Ball Blue Book recommend nor have a recipe for cold packing or raw packing Asian pears. Note: you both heat the Asian pears and then pack the Asian pears in the same syrup! Pack the Asian pears into sanitized jars (leaving 1/2 inch space at the top) and cover with boiling sugar syrup leaving 1/2 inch head space. (If you don't cook or heat the Asian pears first, this is called "cold packing"). Run a rubber spatula or table knife gently between Asian pears and jar to release trapped air bubbles. To do this more effectively, tilt the jar slightly while running the tool between the fruit and the edge of the jar and also pressing inward against the fruit a few times. Now add 1 tablespoon bottled lemon juice per pint jar or 2 tablespoons per quart jar. After packing the Asian pears in the jar, pour the sugar solution up to 1/2 inch (1 cm) from the top. the fruit should be covered completely. 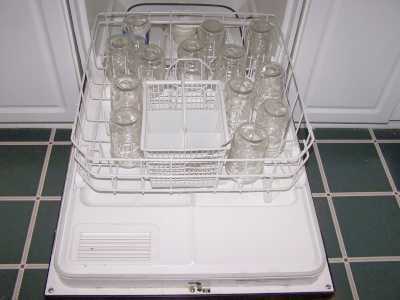 Wipe rim and screw threads with a clean damp cloth. Add lid, screw band and tighten firmly and evenly. Do not over tighten. 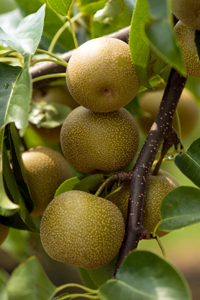 Asian Pears may also show a blue, red or pink color change after canning. This is the result of natural chemical changes that sometimes occur as fruits are heated. It is harmless and won't affect flavor! You can "can" Asian pears in either a water bath or pressure canner. Recommended process time for Asian Pears, halved or sliced in a boiling-water canner. Lift the jars out of the water and let them cool without touching or bumping them in a draft-free place (usually takes overnight), here they won't be bumped. You can then remove the rings if you like, but if you leave them on, at least loosen them quite a bit, so they don't rust in place due to trapped moisture. Once the jars are cool, you can check that they are sealed verifying that the lid has been sucked down. Just press in the center, gently, with your finger. If it pops up and down (often making a popping sound), it is not s ealed. If you put the jar in the refrigerator right away, you can still use it. Some people replace the lid and reprocess the jar, then that's a bit iffy. 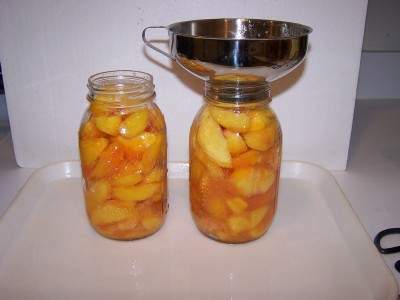 If you heat the contents back up, re-jar them (with a new lid) and the full time in the canner, it's usually ok.
Canned Asian pears and pear nectar will maintain quality best when stored up to 66 months at 40/F, 40 months at 70/F, or 15 months at 90/F. If you'd rather dry or freeze Asian pears, let me know; I'm working on those directions. Dried pears can be stored up to 24 months at 40/F, 3 months at 70/F, or 1 month at 90/F. Well packaged frozen pears will keep up to 18 months. Is it safe to can unpeeled pears? I've spent hours on websites and read several books on canning - to no avail. This is the second year I've canned unpeeled pears in a 5 to 1 water to sugar syrup (we're still alive). All my friends, their mothers and everything I've read says to peel and I'm beginning to buckle under all the finger wagging!!! Answer: Buckle not! It is perfectly safe to can pears with the skins on! Bartlett - Popular pear for canning and fresh fruit. The fruit normally large with a smooth and attractive appearance. Flavor is considered to be tender, juicy, buttery and of high dessert quality. Ripens in most areas in late August to early September. Orcas - Yellow fruit with light red blush. Large, flavorful pear, good for fresh eating, canning, or drying. Ripens in most areas in early September. El Dorado - Medium to large fruit, with a lumpy surface. It is yellow-green even when ripe. el Dorado has a very long storage life, keeps until January-February. The quality is very good to excellent, considered sweet, smooth, melting. Ripens in most areas in mid-October.